제45회 International Coffee Hour에 참석해주신 분들께 감사드립니다. Thank you for your attendance at the 45th International Coffee Hour. 어학교육팀에서는 2019. 3. 27. 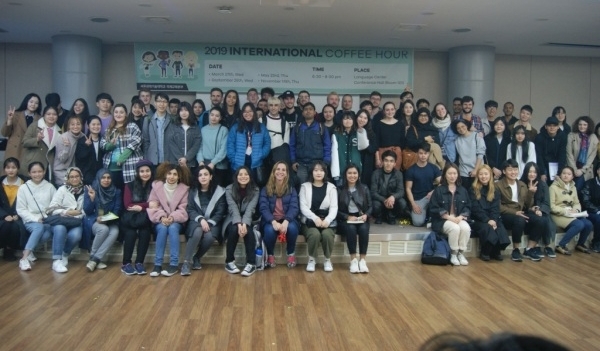 (수), 제45회 International Coffee Hour 행사를 실시하였습니다. 이번 행사에는 '한국음식과 전통놀이 체험' 이라는 주제로, 외국인 친구들에게 한국의 다양한 음식과 전통놀이를 체험했었습니다. 약 150여명의 외국인 및 내국인 학생들이 참여하여, 한국을 대표하는 음식인 떡볶이, 순대, 튀김, 꼬마김밥, 만두, 순대볶음, 곱창볶음, 닭강정, 모듬전 등 여러 음식을 맛볼 수 있는 시간을 가졌습니다. 더불어, 학생들이 직접 mingle game과 함께 한국 전통놀이인 제기차기 체험을 통해 다양한 문화 및 서로를 알아 갈 수 있는 경험과 한국의 전통놀이 체험을 통해 의미있는 시간이 되었기를 바랍니다. 5월에 진행예정인 제46회 International Coffee Hour 행사에도 많은 참석과 관심 부탁드립니다. Thank you everyone for your attendance and participation in the 45th International Coffee Hour. With the theme of "Korean Food and Game," participants tried Korean foods from our local restaurants, such as 닭강정(Dakgangjeong), 떡볶이(Ttcok-bokki), 튀김(Fries), 김밥(Gimbap), 만두(Mandu), 곱창볶음(gobchangbokk-eum) and 순대볶음(sundaebokk-eum), and various Korean snacks. 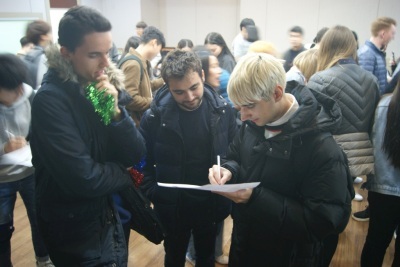 Participants also played Mingle Game, which they asked about experiences and hobbies each other. By the end of this game, Korean and international students were able to know each other better and build friendship. 15 excellent participants were awarded small gifts from the Director of Office of International Education. Congratulations! We hope you all enjoyed the first International Coffee Hour this semester. Next coffee hour will be also about experiencing Korean culture and food. So, please mark your calendar for May 23rd, Thursday, 6:30PM, Conference Hall, Language Center. Ryan Hoots 교수님의 Digital Literacy Club 참여희망자를 모집합니다.